Check out scenes from the first Spot Bouldering Series comps of the 2009 season. 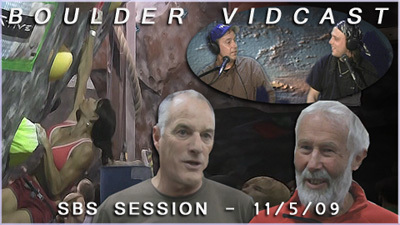 Lot’s of FRB interviews with legendary climbers like Sir Chris Bonington and Bob D’antonio by Jeffery Broussard and climbing legend Mike Brooks. This entry was posted by JVonD on November 5, 2009 at 4:20 pm, and is filed under Bouldering, Business, Climbing, Interview, Studio. Follow any responses to this post through RSS 2.0. Both comments and pings are currently closed.